PBR - If you've been following along with my recent posts then you may know I've established a mathematical formula that easily allows for the comparison of baseball clubs across eras using three important metrics. If you haven't been following I strongly suggest you check out these two articles to get up to speed: [Part I | The myth behind earned run average and batting average] and [Part II | The creation of the Greatness Number]. Using the Greatness Number formula (.503+(OPS*.097)+(RDiff*.006)+(WHIP*-.053) I've ranked every Phillies team from 1900 through 2012 and found the 1945 club to be the worst in franchise history. A two-team town in the 1940s, Philadelphia baseball fans were familiar with the bottom of the standings. The Athletics and Phillies finished last in their respective leagues in 1938, 1940, 1941, 1942, and 1945. Attendance floundered and interest, particularly in the Phillies, waned. 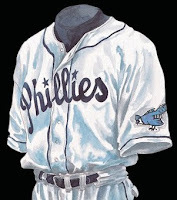 Sensing a need to win back fans, owner Ruly Carpenter sponsored a contest in 1944 to give the Phillies a new nickname and by the start of the 1945 season the Phillies were alternately known as the Blue Jays. The franchise changed the color of the script on their uniforms and added a Blue Jay patch on their sleeve (see image above), yet the team continued to struggle and the new nickname failed to take off. The Blue Jays experiment concluded after the 1946 season. The 1945 Phillies finished the season 52 games behind the Chicago Cubs and pieced together a woeful .299 winning percentage. The club ranked last, or next to last, in every relevant offensive and pitching category in the National League with Vince DiMaggio and his 18 homers the lone bright spot on the roster. The team finished with a -316 run differential. OPS: .634 = -1.5 S.D. WHIP: 1.59 = -2.01 S.D. RDiff: -316 = -2.7 S.D. Combining the standard deviation totals the 1945 Phillies had a standard deviation score of -6.19, marking the club as one of the worst in major league history. The club's Greatness Number is .285, also among the worst in major league history. One more funny note about the Blue Jays nickname - nearly 5,100 entries were received in the nickname contest, yet fans remained disinterested in the club and the new look. Ironically, some students at Johns Hopkins University in Baltimore took offense to the Phillies using Blue Jays as a nickname and logo because it was their nickname and mascot for nearly 70 years. "It is a reprehensible act which brings disgrace and dishonor to the good name of Johns Hopkins University," read a letter written by members of the student body. Over the next few weeks I'll be releasing more info from my Greatness Number study.